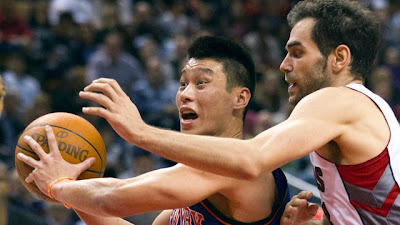 This was the Jose show last night, well... until Jeremy Lin rained on his parade. But Calderon had another amazing game for the Raps, 25 pts, 9 assists and 7 boards as Jose has been stellar on the offensive end for the past two games. Just too bad that the game had to end with a Jeremy Lin gamewinner. Kleiza with another solid performance off the bench for the Raps as he played extended minutes last night agaisnt the Knicks. 15 pts/11 boards, that marked his first double double of the season. Hey man....it my points-only fantasy league, blocks are worth three points. So Amir, you get the fantasy shoutout for this performance! Harvard is in the building. You would think this game was at MSG last night, but no....the #LINsane Torontonians were all about Jeremy Lin last night, even though he put the dagger to Toronto's Raps. C'mon Raps fans!! Get behind your team! Win a #FREESTEVENASH shirt here.